When I saw the weekend weather report I thought “It’s a great weekend for running in Oregon!” Normally I don’t race this time of year, but I have never shied away from running in the rain. 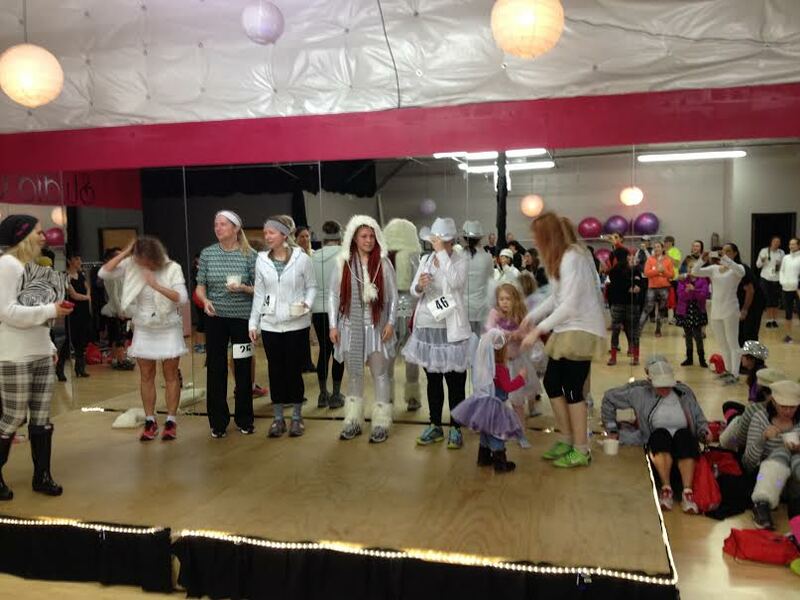 I would, however, shy away from 40 MPH winds, funnel clouds and thunderstorms, which was the forecast for 1PM yesterday, just about the starting time for the Snowflake Dash in Tigard, organized by the lovely ladies at the Diva Den Studio in Tigard. I thought I should call to see if the race was canceled based on the forecast but they assured me the race would go on. Fantastic, 3 miles in Portland “snow”: driving, sideways rain. Or so I thought! Getting to the Diva Den Studio was easy, I was just down the road watching my 9 year old play a youth basketball game. I was able to easily park in the lot they recommended just below their building. Packet pick up was so smooth, my packet was just sitting on top of the pile when I arrived. 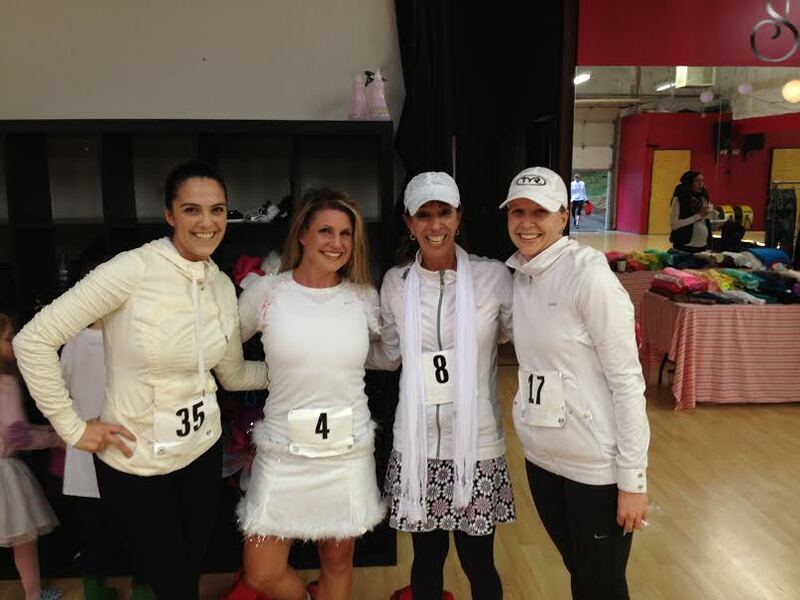 The Divas told me they had about 65 registered runners, exceeding their expectations. In all, about 50 of us showed up to brave the weather, most of us had never been to the studio, a genius marketing tool from the Divas! Most everyone, and when I say most, I mean everyone but me, showed up in some kind of costume. There was a contest and while there was a clear winner, everyone looked adorable. We were encouraged to dress in white, furry, fluffy stuff and I am not a white, furry fluffy kind of gal. If I had anything that fit the bill I would have worn it, but the ONLY thing white I had on were my sunglasses! And I needed them as the sun did peek through the clouds for a bit and then they kept my eyes dry during the rain that came as I ran the last two minutes. The Diva Den Studio, as it turns out, was a killer place for pre-race and post-race festivities. Warm and dry, their studio is in a “garage”, but let me assure you that it does not resemble a garage save for the door that opens. Pre-race warm ups included a dance from the Diva Den Dancers (men, if you didn’t attend this event with your ladies, YOU MISSED OUT!) and then some warm ups and stretches led by the instructors. We all headed out the door and waited our turn, they had us take off in groups of about 20 at a time, a smart strategy as there were stations along the route where we earned additional raffle tickets for door prizes. as it happens, doing burpees and shining stars worked in my favor, I won a one hour massage from the Diva Den (ladies this place is more than just exercise!) and a hair service from Platform Artistic Salon. The course itself was fun, and well-marked and staffed with volunteers to help direct and cheer. The course was 2.8 miles by my Garmin, which matters little to nothing, because the event was just meant to be fun and wasn’t chip timed. And. IT. WAS. FUN. My favorite part was running along Fanno Creek, a place I frequented as a kid to pick blackberries and throw rocks in the water. As we crossed the finish line we each received a pretty sweet swag bag. 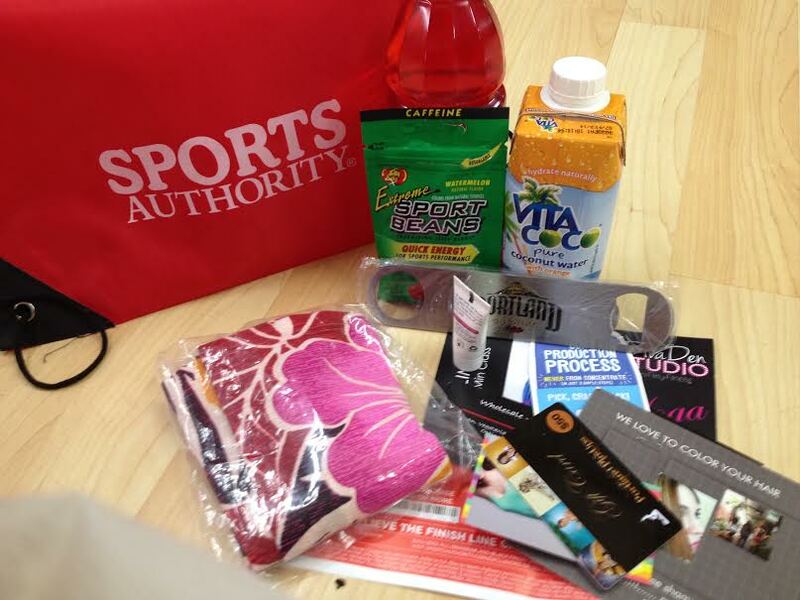 I took a picture of all the goodies in the swag bag because there was so much GOOD STUFF. (well done ladies, one of the best SWAG bags I’ve ever gotten). Included in the SWAG bag are a pair of Wildskins, running sleeves (the pretty floral print you see here) and I cannot wait to wear them! 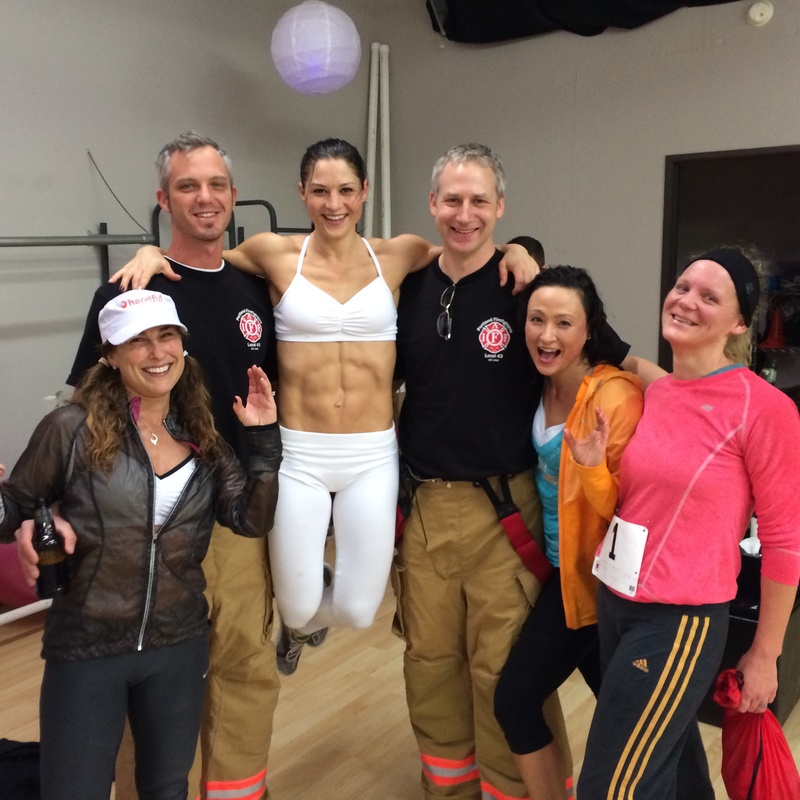 After the race we all huddled in the studio, again, warm and dry, where Portland Brewing Company was waiting with beer, Dutch Bros with coffee and hot cocoa, the Divas had water and coconut water and bananas, and the most delicious soup from Souper Natural! There were also a couple of adorable firemen from Portland who were there to fill the boot for MDA. Post-race, there was an after party at Blitz, where there was even more beer waiting for us! (Side note: I was solo at this event, and did not drink. Next year, I hope to bring a couple of friends with me!) They also had a ton of raffle prizes to give away (as I mentioned I won two!) both at the event and the after party. The Divas made us all feel welcome, cheered us along and created a really fun event that is great for a girlfriends outing. I would put this event on my calendar as a must do every year. It was a great way to start off the new year of racing, no pressure, lots of fun, and, well I did run my fastest pace yet. As the runner up to the costume contest I have to say, I didn’t pull my costume together until hours before the race. The cowboy hat was thanks to my daughter’s spring dance recital and the tutu was from my husband’s “white swan” Halloween costume a few years back! Regardless it made running in the rain a lot more fun!